Landslides in the central province of Quang Binh have paralysed sections of the North-South railway, according to the Vietnam Railways (VNR). A flooded section of the Ho Chi Minh Highway. As of 6:00 pm on October 14, a total of nine landslide sites were recorded in the province due to extensive rain. The Dong Hoi railway station was totally flooded, the VNR said, adding that nine passenger trains and nine cargo trains had to stop their journey on the evening of October 13. Trains running through the North-South line in Hanoi and Ho Chi Minh City were all suspended. All VNR units are doing their utmost to address the incident. The Ho Chi Minh Highway in Quang Binh’s Minh Hoa District is also deep under water and closed to traffic. 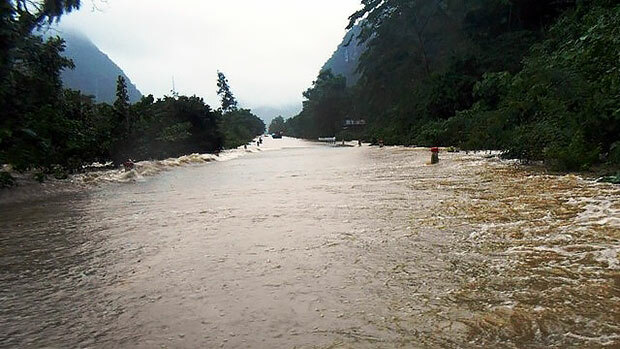 Torrential rain over the past two days has flooded most cities, districts and towns in Quang Binh province, according to the provincial steering committee for natural disaster prevention and search and rescue. A 62-year-old man went missing on the morning of October 14 and is still unaccounted for. Heavy inundation was reported in Minh Hoa, Tuyen Hoa, Bo Trach, Le Thuy, Quang Ninh and Quang Trach districts./.